The global financial services cybersecurity systems and services market is prophesied to up its growth in the near future with the surge in the successfulness and sophistication of cybercrimes against banks, retail chains, and financial services enterprises. Millions of customer payment cards and bank records are compromised till this date, which calls for a burning need to implement effective financial services cybersecurity systems and services. From market drivers and inhibitors, the report provides a detail account of market size, current pipeline technologies, and crucial business prospects. According to the statistics of Transparency Market Research (TMR), the global financial services cybersecurity systems and services market is estimated to earn an approximately US$24.3 bn by the end of 2022 from US$12.5 bn in 2017. Between the forecast years, the market could expand at a 14.1% CAGR. As per the analysis of the publication, the international financial services cybersecurity systems and services market could witness the dominance of the mobile enterprise management segment by solution and services. By 2022 end, mobile enterprise management is expected to clasp a share of 19.5%. Other classifications of the market according to this category could be endpoint security, identity and access management, mobile security, security information and event management, content security, data loss prevention (DLP), datacenter security, and firewall. By end user, the international financial services cybersecurity systems and services market is anticipated to be grouped into banking, insurance, credit unions, stock brokerages, stock exchange, investment funds, consumer financing services, payment card and mobile payment services, and government-related financial services. The report’s study on the segmentation of the international financial services cybersecurity systems and services market is predicted to be extremely critical for gauging opportunities in different segments. The study could also help to identify those segments that are foreseen to demonstrate a sluggish growth in future in order to keep readers informed. On the basis of geography, the world financial services cybersecurity systems and services market is projected to be classified into regions such as the Middle East and Africa (MEA), Asia Pacific except Japan (APEJ), Europe, Latin America, and North America and countries such as Japan. Out of these geographical markets, North America could take the driver’s seat while expanding at a 15.8% CAGR. The attractiveness of this regional market could continue to reign until the end of the forecast period. Europe and Japan could be among the fairly rising markets for financial services cybersecurity systems and services, whereas APEJ is envisaged to lose 86 BPS in its share by 2022 over 2017. The MEA could gather a minimal revenue share by the end of 2017 but is foretold to gain some BPS over the course of the forecast period. Some of the leading industry players in the worldwide financial services cybersecurity systems and services market could be Experian Information Solutions, Inc., Accenture PLC., Agiliance, Inc., IBM Corporation, and Airbus SE. The global financial services cybersecurity systems and services market is prognosticated to be pampered by reportedly a large count of financial organizations taking to managed security services for solutions such as real-time monitoring and analytics and authentication. The significance of financial services cybersecurity systems and services could elevate drastically in the coming years as an enormous amount of sensitive data moves to the cloud. The authors of the report offered herewith forecast the size and growth factors of the global financial services cybersecurity systems and services market, which could be vital for crafting accurate business decisions. Additionally, the report provides decisive information about favorable opportunities prevailing in the market amid the presence of projected growth disincentives. 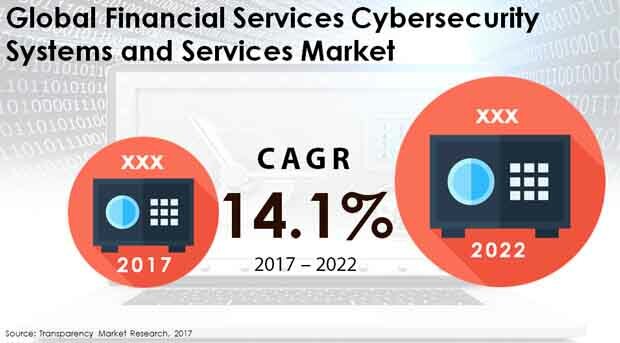 The international financial services cybersecurity systems and services market is envisioned to witness a significant rise in the adoption rate due to changing global privacy and cybersecurity legislation. However, there could be more factors increasing the demand in the market, such as distributed denial of service (DDoS), ransomware, and phishing attacks becoming more sophisticated. Furthermore, financial services security regulators are continuously improving their scrutiny level, thus adding to the growth of the demand. Financial institutions are already weary of maintaining compliance with additional cybersecurity standards of the New York State Department of Financial Services (NYDFS), Commodity Futures Trading Commission (CFTC), and National Association of Insurance Commissioners (NAIC). While these standards are significant, financial firms struggle with reconciling the sometimes contradictory guidance. Nonetheless, with financial services cybersecurity systems and services in place, compliance with the cybersecurity standards could become stress-free and thoroughgoing. The world financial services cybersecurity systems and services market is prophesied to be segmented according to two categories, i.e. solution and services and end user. By solution and services, the market could be divided into diverse segments such as endpoint security, identity and access management, mobile enterprise management, mobile security, security information and event management, content security, data loss prevention (DLP), datacenter security, and firewall. Amongst these, mobile enterprise management is envisaged to garner a colossal share in the market while rising at a 20.8% CAGR between 2017 and 2022. By end user, the world financial services cybersecurity systems and services market could be segregated into banking, insurance, credit unions, stock brokerages, stock exchange, investment funds, consumer financing services, payment card and mobile payment services, and government-related financial services. By region, North America, Latin America, Europe, Asia Pacific except Japan (APEJ), and the Middle East and Africa (MEA) and Japan are anticipated to be significant markets for financial services cybersecurity systems and services. With a US$3.6 bn expected to be accumulated in 2017, North America could showcase dominance until the final forecast year. The report analyzes crucial players operating in the worldwide financial services cybersecurity systems and services market, such as Experian Information Solutions, Inc., Accenture PLC., Agiliance, Inc., IBM Corporation, Airbus SE, AhnLab, Inc., VMware, Inc., Akamai Technologies, Inc., Alert Logic, Inc., AlienVault, Inc., and Avast Software S.R.O.